As you grow older, regular exercise can help boost energy, maintain mobility, and manage symptoms of illness. Exercise can even reverse some of the symptoms of aging. 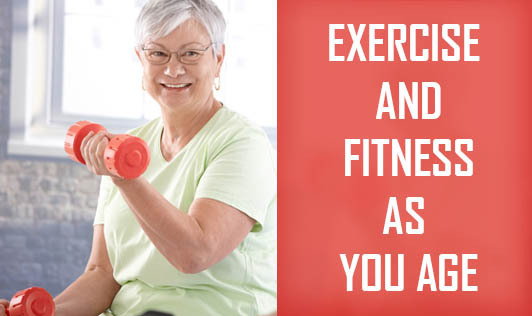 As you age, regular exercise is more important than ever for your body and mind. It’s not just about adding years to your life, but adding life to your years. Here are some of the major benefits of exercise. Helps maintain weight or lose weight- Exercise helps increase metabolism which naturally slows down as you age and builds muscle mass by burning calories. This in turn improves overall quality of life. Reduces the impact of illness and chronic disease- Benefits of exercise above the age of 50 includes improved immune function, better heart health and blood pressure, better bone density, and better digestive function, plus lower risk of several chronic illness like Alzheimer’s disease and cancer. Enhances mobility, flexibility, and balance in old age- Exercise improves strength, flexibility, and posture, which in turn helps with balance and coordination, and in reducing the risk of falls. Improves sleep- Exercise often improves sleep, helping you fall asleep more quickly and achieve better quality sleep. Boosts mood and self confidence- Exercise is a huge stress reliever and the endorphins produced can actually help reduce feelings of sadness, depression, or anxiety. Good for the brain- Exercise benefits brain function which is as diverse as multitasking and creativity can help prevent memory loss, cognitive decline, and dementia. Exercise may even help slow the progression of brain disorders such as Alzheimer’s disease. Get medical clearance from the doctor especially if you have any preexisting medical conditions which require assistance. Consider your health condition. Keep in mind on how your ongoing health problems will affect your workouts. Start slow. This prevents injury and discomfort during warm ups, cool downs. Stay motivated by focusing on short-term goals. Recognize the problem. Exercise should never hurt or make you feel lousy. Stop exercising immediately and call your doctor if you feel dizzy or short of breath, develop chest pain or high blood pressure, break out in a cold sweat, or experience pain.